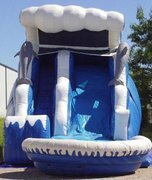 De Leon's Party & Event Rentals - bounce house rentals and slides for parties from Mission to the entire valley. 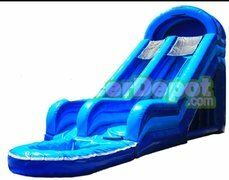 Island Paradise Slide is a great unit for backyard parties and events with smaller kids 9 and under. 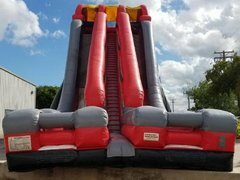 A fantastic slide for backyard parties, schools, churches, and more. 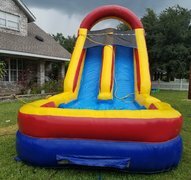 18ft double lane dry slide with rear access. This is a huge 30' tall water slide. This Hurricane curves and twists. It is very tall and wide for a thrilling time. Truly an incredible money-making slide that draws huge crowds at any event. 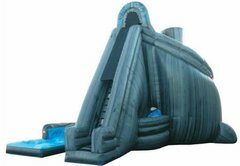 This slide towers above almost all other inflatables and even most trees.